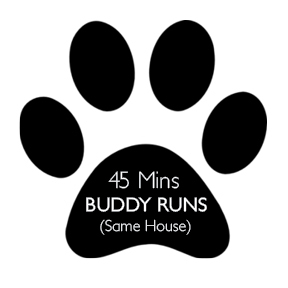 Buddy Runs where we will match your dog with a compatible buddy in your area. Runs last 45 Minutes and include paw wipe off and refresh of water bowl after the session is over. Quantities of runs per week will depend on your schedule and the fitness level of your dog. Once your membership is booked online, we will contact you to schedule your runs! Be the first to review “45 min BUDDY RUNS (Match up)” Click here to cancel reply.